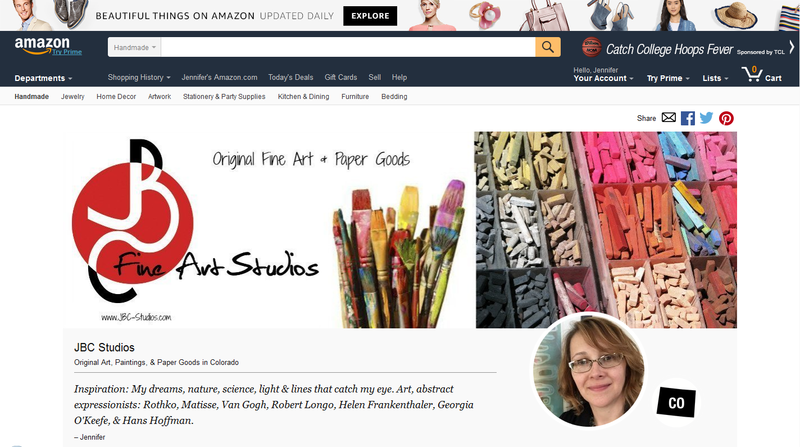 No foolin’ JBC Studios now has shop on Amazon @AmazonHandmade! Cool right? Stop in and check out my new storefront on Amazon, let me know what you think. 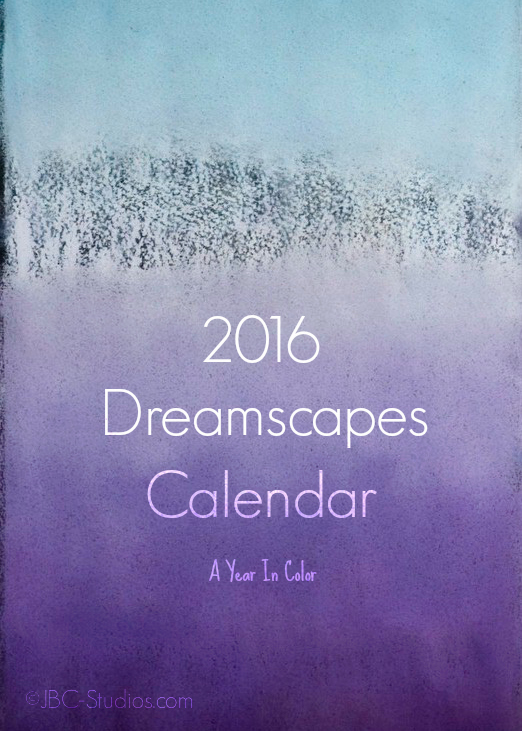 My 2016 Dreamscapes Desk Calendars are available for purchase. These make great gifts. We have a very limited number of these beauties though. 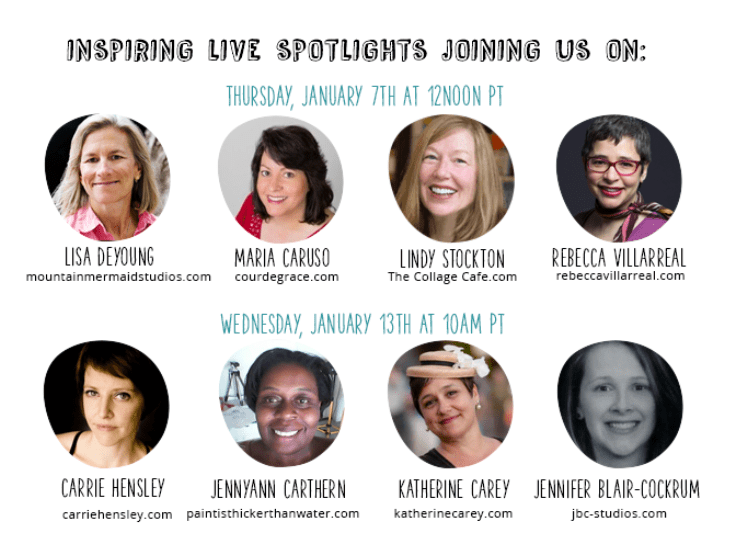 Guess who is going to be on a live spotlight panel with @artizencoaching on Jan 13th? Me!!! Super excited to have you join us. Part 2: Wednesday, January 13th at 10am PT for 75 min. Learn more about the upcoming Right-Brain Business Plan® facilitated e-Course (based on Jennifer Lee’s bestselling book) that will help you create your road map for your business success. To sign up for this free online video class that Jennifer Lee is offering “Creating Your 2016 Big Vision” click here. Don’t worry they’ll be on camera, you will be able to post questions and chat online as you hear from these amazing creative entrepreneurs. What do you have to loose? Right-Brain Business Plan® is a registered trademark of Jenn & Brian Creative, Inc. (DBA: Artizen Coaching). Learn more at www.rightbrainbusinessplan.com. If you have trouble with video link above click here. There are many steps to the process of creating art work and preparing art work for exhibition and sale. First the idea or concept is developed, materials gathered, time to work and create, editing, then of course prepping work for show and sale. 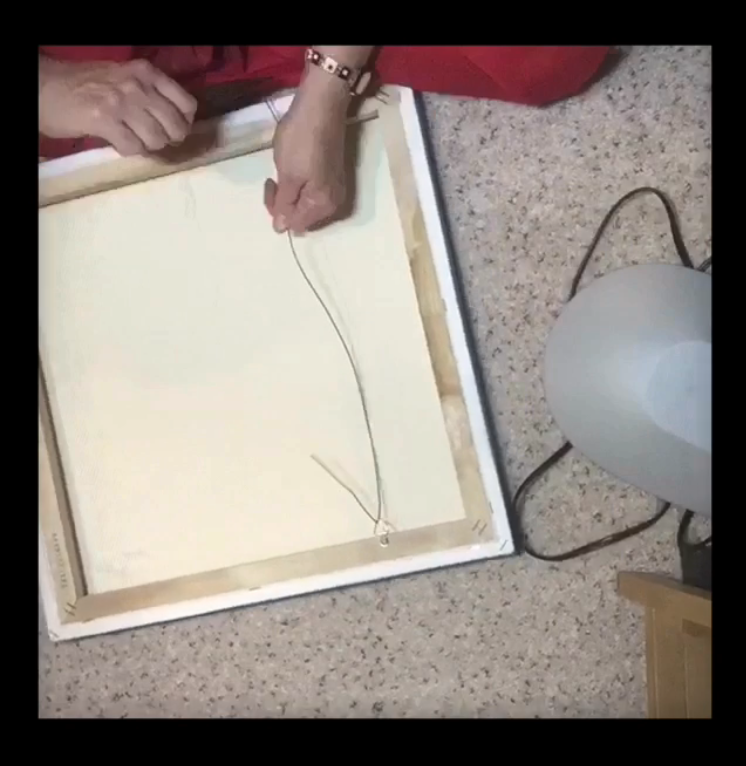 Enjoy this behind the scenes video as I prep for upcoming Summer Art Market wiring art work! Many folks are curious about artists’ studios, the creative process, finding inspiration, and the space in general. Many of you have asked me during art shows, festivals, and exhibitions, “Where is your studio?” “How do you create your art work?” Well to answer your questions, I have created this special little video. Now I have to tell you, making and sharing this studio sneak peek video is a BIG leap for me. I’m really stepping out of my comfort zone when I share my cozy little creative sanctuary. My studio space is something I tend to keep kinda private. In this short video you’ll go behind the scenes of JBC Studios and get a studio sneak peek. You’ll get a glimpse into some of my creative processes, studio atmosphere, tools I use, and see some works in progress. You’ll see it’s organized chaos. Creativity is a messy business! My studio space is a very special place to me. It’s where I create, problem solve, and get into my “creative zone”. Please enjoy my Studio Sneak Peek video that I have crafted especially for you. P.S. My next event is the ASLD Summer Art Market in June. Don’t forget to Sign up for updates, more sneak peeks and juicy insider tips! Some inspiration for your holiday studio time. There is a rhythm to music, just as there is a natural rhythm to creating and viewing art work. Art and science collide here, while putting on a great show as we see paints fly to beat of the music. Watch as the colorful paints fly, bounce, and mix before your eyes in this visual feast of color. Although, The Slow Mo Guys created this great video to demonstrate sound vibrations and waves, I appreciate it for its inspirational fun qualities. I wonder how the music I listen to while I am painting affects my own art work? Generally I listen to rhythm and blues or jazz, some rock n roll too. I enjoy reading audiobooks while I paint and see paints fly. Music is felt, just as art is felt. Artists, what music do you listen to while you create? Art is for everyone, even if you can’t explain why you love a piece of art. Art can connect with us on a level that is beyond words, bring us to another space, stops us and demand we examine it further. Art speaks to us through our eyes, yet we experience it with our soul. If art speaks to you, listen. Comedian Brian Regan does a fantastic job of joining the “I Love Art” conversation and bringing it down to earth. Enjoy a clip from his tour “The Epitome of Hyperbole” (2008). Do you love art? What is your favorite piece of art? Join the “I Love Art” conversation on Twitter at @JBCStudios Tweet images and names of your favorite art works, use the tag #ILoveArt . There are no wrong answers to this question. NO COPYRIGHT INTENDED. Comedian Brian Regan during “The Epitome of Hyperbole” (2008) on the topic of art. Who collects art? Everyone from anywhere can and does collect art. Do you need to have a degree in art or design to be able to start collecting art? NO, if a piece speaks to you, get it, you don’t have to know why. You will figure that out over time. 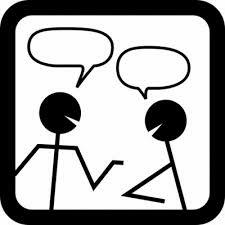 The work will engage you now and continue to engage you over time. You will see it differently: as you age, as your life experiences grow, as your mood and outlook on life continue to evolve, your perspective and experience of the work will be dynamic. Does art work need to match the couch, decor, wall color? No, I honestly believe if you like it and it speaks to you, then it will fit within your own aesthetic and style. You may not be aware of your own aesthetic, but we each have one. It is how we select our clothes when we get dressed, what color towels you own, the color of your walls inside and out of your home, it is the palette of your wardrobe. All these little decisions add up to your “style” that is uniquely yours. Collecting art is not rocket science, it is paying attention to what grabs you and keeps engaging you. Why buy art? Art does more than decorate a space. It creates discussion, a mood or tone, a focal point, a place to start a conversation, it makes a statement, it generates questions. Asking questions is a good thing. Art elevates our soul and our mind. Collecting art, seeing art enriches your life. Can I really afford to buy art and start collecting art? Yes, anyone can buy art. Buy what you like and what you can afford at that time. Get to know the artist you bought it from. Connecting with the work’s creator is very enriching. Collecting art should be fun, like a scavenger hunt. Knowing the artist helps to understand the piece further as well have give you a greater appreciation for art, the artist, and your own experience of the piece. How many pieces do I need to have to have a collection? One. Collecting art can and should be something you do for fun, and over time. Herb and Dorothy Vogel lived a simple life on a modest salary. She was a librarian and he was a postman. Over time they were able to collect over 4, 000 pieces of original art work from a variety of artists. Their collection has been on exhibition, reviewed, written about, and their opinion sought after. They collect artists/friends, rather than just art, watch video clips about the Vogels. Megumi Sasaki made a documentary about this extraordinary couple who, thankfully, appreciated and hoarded art with a passion since 1962 and are willing to share their still growing collection with the public. Herb & Dorothy Selected Clip #4 from Herb & Dorothy on Vimeo. After the National Gallery of Art could only accept 1,000 pieces from their massive stashes of fine art, Herb and Dorothy decided to create the 50×50 project. Portions of Herb and Dorothy Vogel’s art collection will be traveling to every state in the US as part of a the 50×50 project. 50 pieces selected from their collection will travel to each of the 50 states. See when part of their collection is coming to your state, click here to hear more. Artists in their collection: (The Vogels collected from many artists when they were starting out and continued to collect their works and follow the artists, as well as they got to know many of them over the years). I am a professional visual artist based in Golden, Colorado. Creating images with my hands using pastels, watercolor, and/or acrylics comes from a want or need to create. This desire has always been there, if I don’t get to create and share this visual dialogue I tend to get cranky. Read more about me.. Inspired by my dreams, my work is more about the experience or connection to it. Influenced by the Abstract Expressionist movement, my organic abstraction work takes a softer approach drawing the viewer in, using bold layers of colors, subtle texture, and inviting glow. I paint within a framework. However I would say that I paint more intuitively with rules that I set for myself. The intent of my art work is capture and share my perspective, thereby initiating a dialogue with the viewer. Connection with my work is important as well as the viewer’s experience. Typically a piece starts in my head, a glimpse or a swim through a color field filled dream. Some thumbnail sketches with notes will be jotted down. After I enter my studio, my work apron is donned, music usually blues or jazz is turned on. 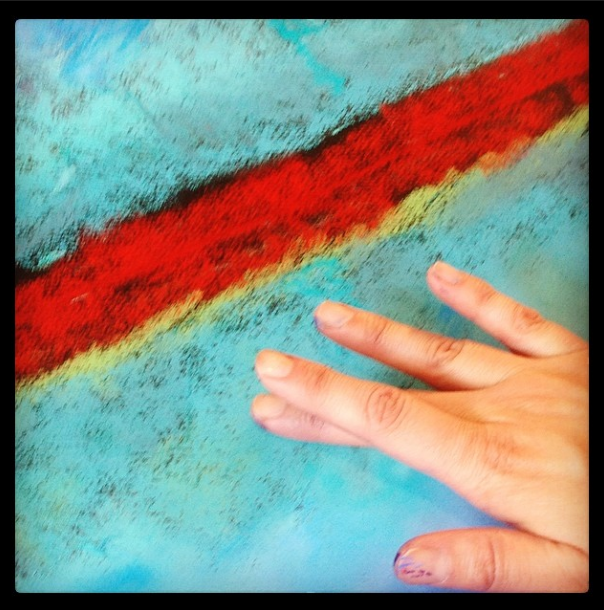 I decide the scale of the piece, select the ground or paper to build up the layers of color. As my hands practice a motion or line, they hover with a bright pastel above the paper and practice the gesture or line that will start this creative process of painting. My hands get all messy with colors, it feels good as the colors smear across the thick paper like a piece of soft chocolate. In between colors I use some baby wipes to clean my hands and keep my colors pure and vivid. I get into a groove…I am in the zone, no worries of time, weather, bills, life. I am focused on the piece, its overall feel, design, what it’s saying to you the audience. Often as I paint, I think of my collectors and smile. I am not sure whom specifically I am creating this art work for, however as the piece matures it’s voice, I become more confident that it will resonant with them. It is not uncommon for me to work on multiple pieces at one time or in a series. As one piece is created and evolves, other ideas bubble up and morph into what will be the next piece. A series of pastel paintings about dreams, called Dreamscapes for an upcoming art show at the Arvada Center for the Arts and Humanities. Blending and building layers of rich colors while still allowing some vivid jewels of color to shine. Horizontal lines are a dominant theme in my work as well, identifying with harmony, balance, and a sense of a landscape beyond. Dreamscapes is a series of soft pastel paintings inspired from my own vivid dreams in creamy vibrant colors. Boldly painted, these pieces are surreal and serene, providing a place to rest the mind. It is through our own dreams that we explore our perceptions and conquer our mental boundaries. Now who will be next on the Art Around the World Blog Hop? 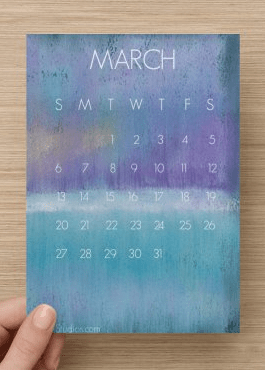 The next featured artist in the Art Around the World Blog Hop comes to us from New York City, NY. 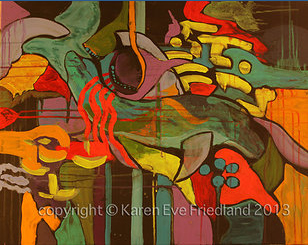 Karen Friedland is full of color and texture. As a loyal transplant to Brooklyn, Karen hides a little bit of the Brooklyn Bridge in each of her paintings! She works in mixed media with a Matisse like quality all her own. She is represented by Trapani Art Gallery in Manhasset, New York. Please visit her blog hop post on Monday Oct 20th, Broken Artist Blog.